Dog fence rolls create a basic outdoor dog enclosure for all dog breeds. "At first I thought we wouldn't be able to do it, but once we watched the videos and took our time it became easier. It took us a week doing some each day but it turned out better than expected and the dogs love it." 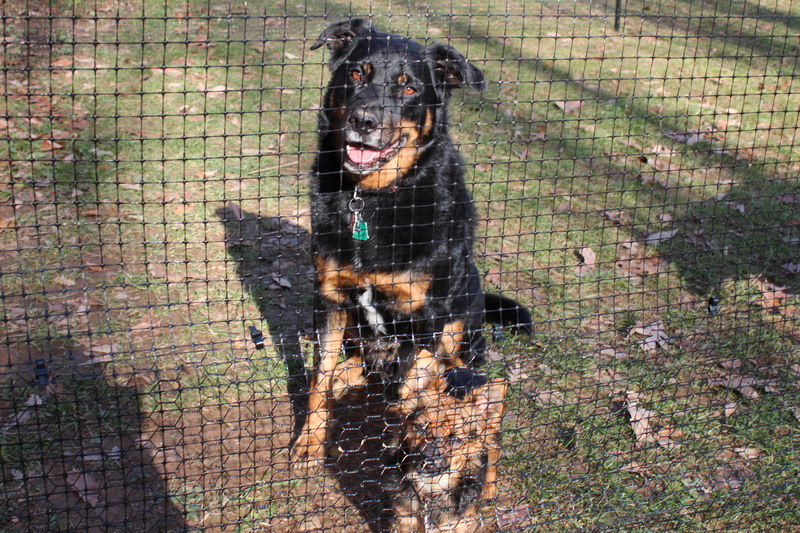 Sandra C.
Deerbusters easy to install dog yard fence guarantees that dogs will not interface with wildlife that may attempt to harm the pet and will keep them safely contained for years to come. Deerbusters fencing for dogs are made from a tough polypropylene fence material that will protect both dogs and landscape. Poly dog fence rolls serve as a great puppy fence for small dogs that will will not jump or challenge the dog enclosure. This plastic dog fence will not corrode or splinter like traditional puppy fences or chain-link fences and are UV-stabilized for increased longevity in all weather patterns. For large, high energy dogs that like to chew and dig, Deerbusters offers PVC-coated steel fence in a hexagon mesh as well as in a welded wire. These dog outdoor enclosures are built to last up to 20-30 years - even after years of chewing! Please note: Deerbusters does not carry electric dog fence or shock collars. Deerbusters pet fence are humane for all dog breeds.